I’m so EXCITED for this look! I was going to save it for the 31st but I couldn’t keep it together, I love it SO MUCH! Ok, Mimi, calm down, because I want to tell you something and I want to keep it short: I’m not the best when it comes to fun/crazy/creative make up looks, I usually play it safe so althought I love to experiment, expecially for Halloween, each look I will create is going to be relatively easy nothing with wigs, silicone or prosthesis. Honestly I feel like we are all in the same sea, we see this spectacular looks on youtube that most of use won’t ever recreate and I do want you to recreate what I do! If you like it OF COURSE! 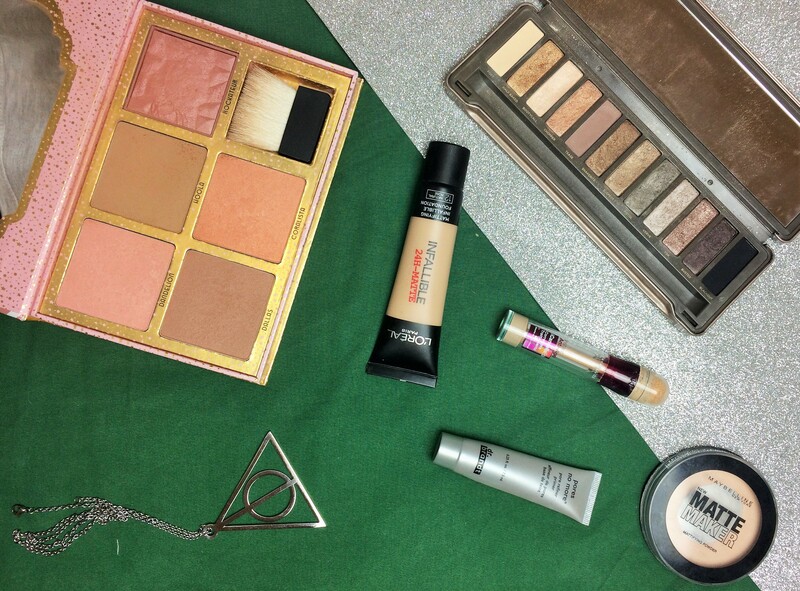 Also, I don’t like to spend money in products I’ll use maybe once, so for my looks I’ll use things that I already have in my collection or super affordable brands. 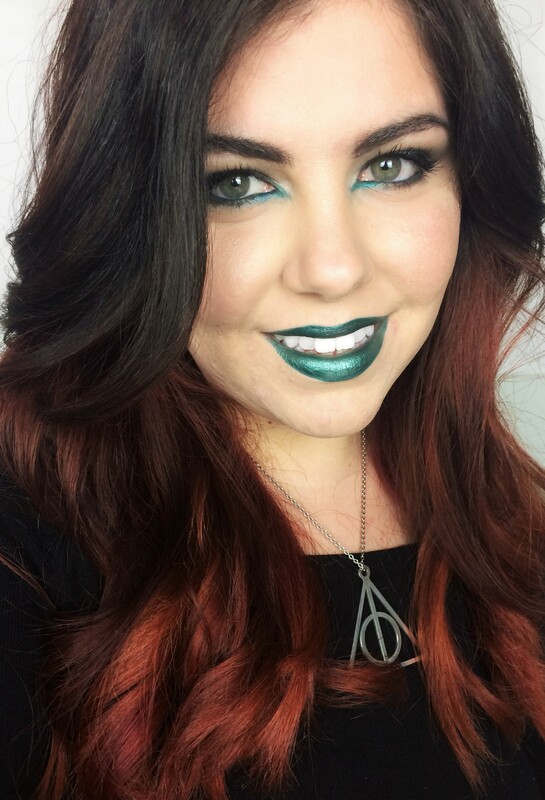 Being the huge Harry Potter nerd that I am, I decided that my first look was going to be a SLYTHERIN LOOK, fyi, my house. This look isn’t really something ispired by any character so I feel like it could easly be a snake look… I keep singing Look What You Made Me Do in my head! Let me know what house you are in and if you want a look inspired by them, I’ll be more than happy to do it, seriously MORE THAN HAPPY! Highligther: Urban Decay Eyeshadow in Verve, I used this shadow from the Naked 2 because I wanted a silver glow, any silver shadow will work, I don’t really use silver on myself at all, that’s all I have. Primer: Maybeline Eyestudio Gel Liner in Black Chrome, I used it as a base for my shadows. Eyeshadow: Smashbox Full Exposure Eyeshadow Palette, I started with the dark grey (last shade top row) all over the lid and then I used second to last shade from the bottom row, a cool brown, in the crease to create a soft smokey look, very winged towards the outside. Then I used the same Verve eyeshadow on the inner corner and in the middle of the lids. On the lower lashline I use the dark grey from Smashbox mixed with the black. 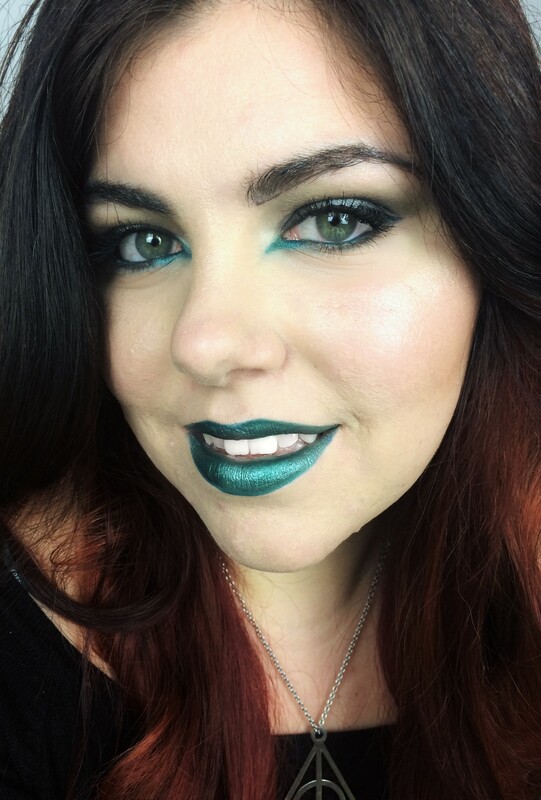 To do the wing in the inner corner I started with the Essence Gel Eyepencil, (I have no idea what shade it is, it doesn’t have a name on the packaging) it’s a gorgeous Teal shade, I put it in the waterline and draw the fake inner corner, ot top of it I put this stunning NYX Pigment in Vermouth. 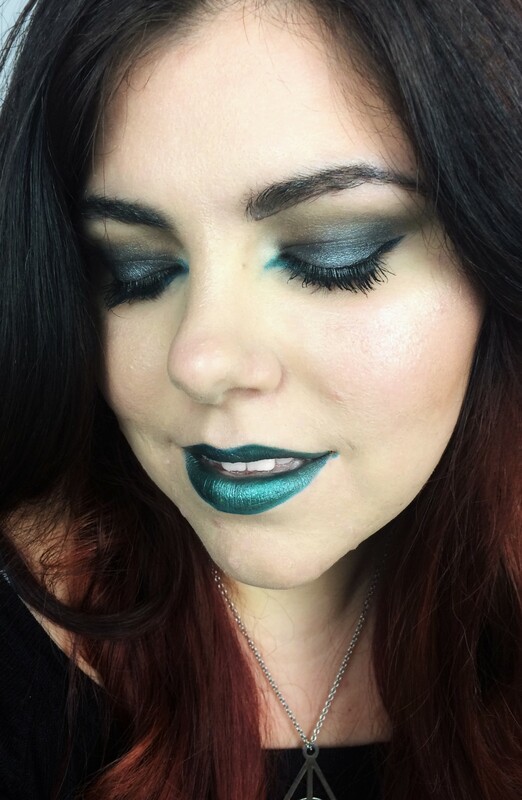 At the end, I slightly blended the pigment at the edge of the smokey eye to give it a green hue. Eyeliner: Kat Von D Tattoo Liner in Trooper, I did my usual wings + Sephora Kohl and Liner in Intense Black, I used it to thigh line. Lipstick: NYX Wicked Lippie in Risquè I love this colour so much, I kind of want to wear it everyday and the formula is so good too. I’ll definitely buy more shades! I really hope you guys enjoyed it, don’t forget to like, comment and share to let me know all your thoughts. If you recreate this look don’t forget to tag me @blushydarling and use the #MakeupMonday. Please subscribe to my social medias: I am on Instagram, Twitter and Facebook. That make up is gorgeous! Why would you only wear it for Halloween? 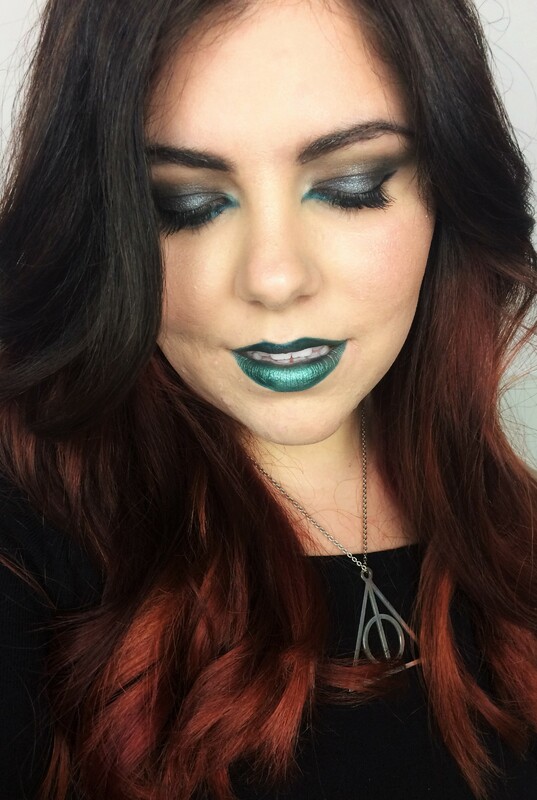 I love the look, and it’s executed beautifully 🙂 I consider myself s Slytherin girl myself lol and this green will look great with my hazel eyes…. so I will have to save this one for sure. Great job! Oh wow this is beautiful! I actually like these creative Halloween looks more than those that are using blood and sillicon and what not! I enjoyed this one as well! Wow you look stunning! You totally pull this look off. Such a cool look! I still need to figure out my Halloween makeup. 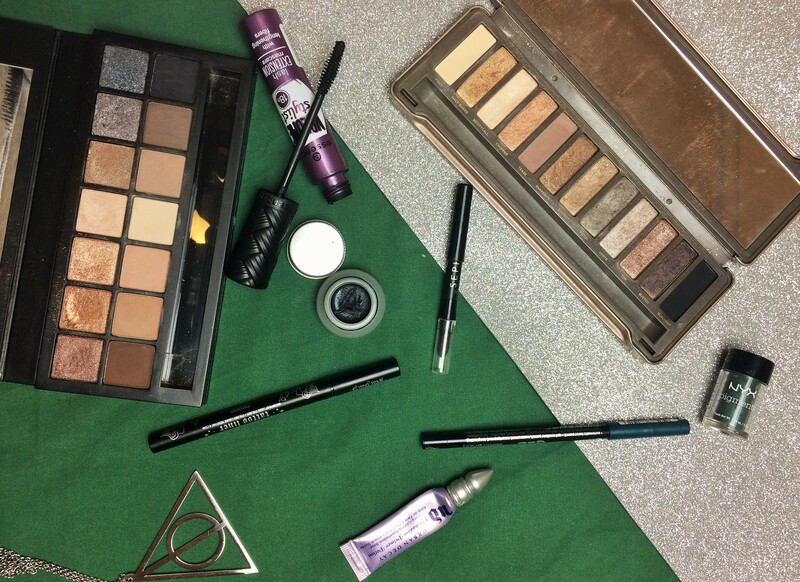 I love the eye shadow on you! It would be a great, fun look for a night out. That lip is FIRE!!! 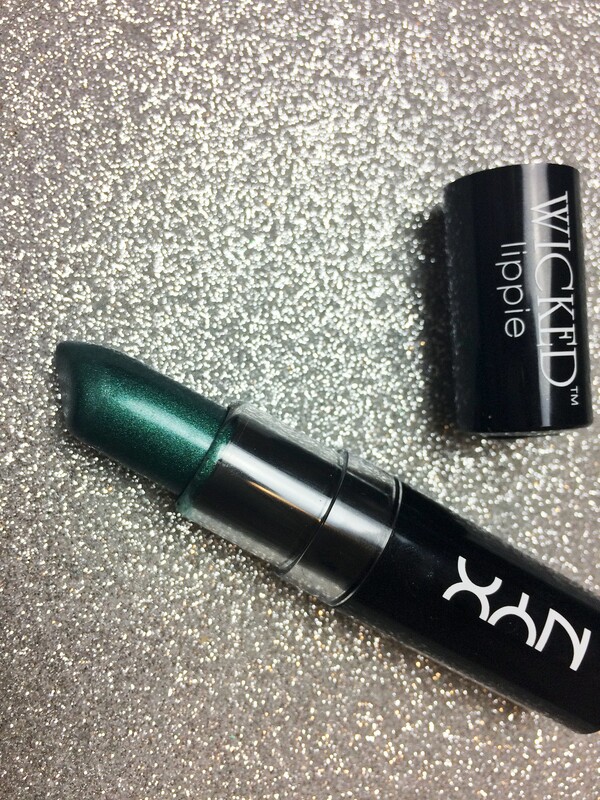 I love that it’s by Nyx. One of my favorite cruelty free brands. Gonna have to scoop it up. This look is super cute! Ahhahaha so cute!! I can’t wait to see the pictures 😉😉 slytherin united! Such a cool idea! I’m a Hufflepuff; I would love to see what look you can come up for it! This look is everything! Such glamour, much halloween inspo! Haha that’s what sisters are for! !